"For me, the unknowns of the process make for a journey of self-discovery and a more meaningful painting experience." Ellen Rolli earned her degree in Art Education with a minor in Painting at the Massachusetts College of Art in Boston. In 2009, she completed a residency at the historic Fine Arts Work Center of Provincetown. 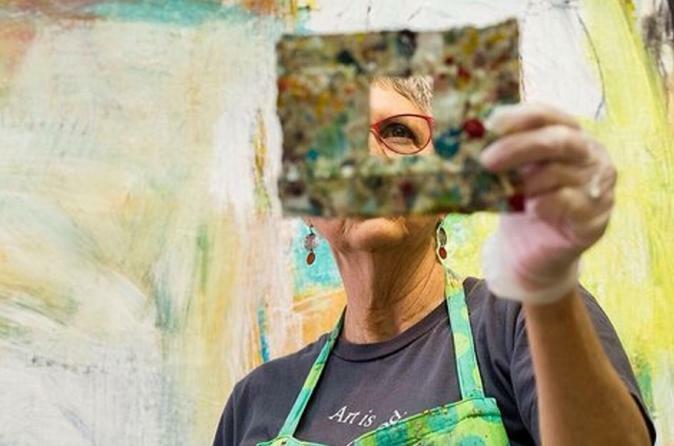 The recipient of many awards, Ellen's paintings are held in numerous private and corporate collections throughout the U.S. and abroad. We’d love to hear more about Ellen Rolli, Contemporary Painter. In 2009, after completing my Artist Residency in Provincetown, my work shifted form representational work to abstraction. So, for many years now, I am know for my abstract work. I consider myself a contemporary abstract painter, and as I express in my artists statement, “I do not search for the literal truth of a subject, I seek an expressive, emotional reaction.” On any given day, I might be working on a very large canvas, and the next day move to a small work on canvas or paper. I am always eager to talk about abstraction as an art form, and love when studio visitors want to learn more about abstract art my creative process. I am proud of the fact that I have always remained true to myself as an artist, painting for me, as I am my own toughest critic. When my work resonates with others, when someone chooses to purchase a work and live with it, that is very rewarding. I think authenticity in an artists work is so important. My teaching experiences are also a fulfilling addition to my life as an artist. To inspire others and share what I feel so passionate about is very special, and a wonderful way to pay it forward.